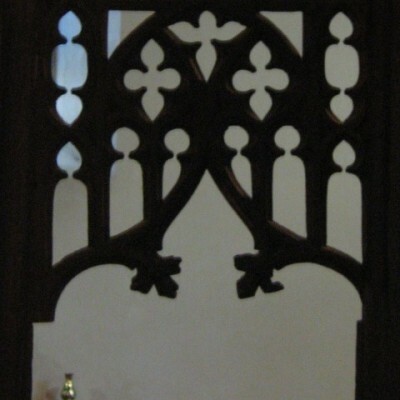 The glory of St Michael’s Church is its 15th century rood screen. 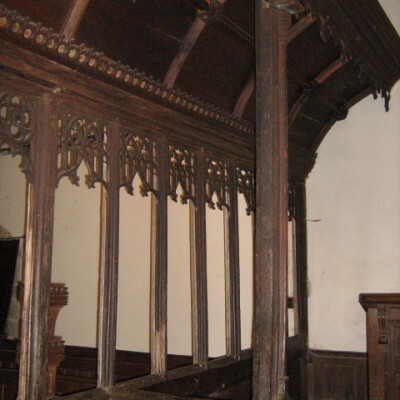 Fortunately the loft survived the Reformation, although like other churches it lost its ‘rood’ – a wooden carving of the crucifixion with figures of the Virgin Mary and St John on either side. The screen separated the nave (congregation) from the chancel (priest). 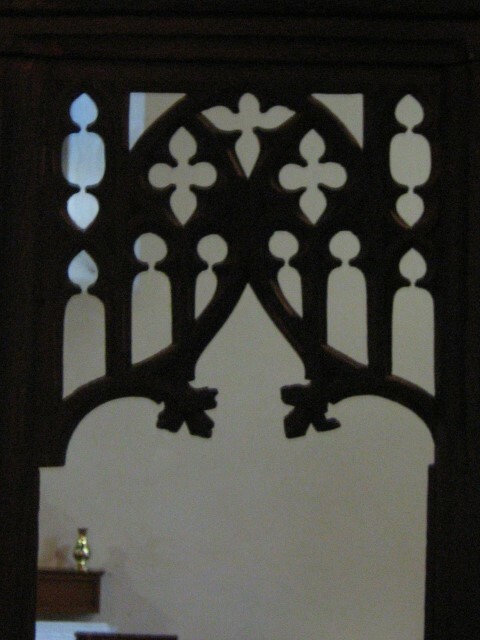 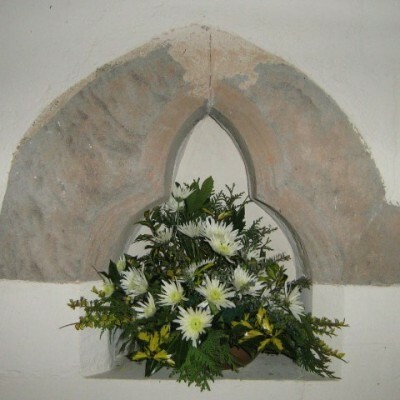 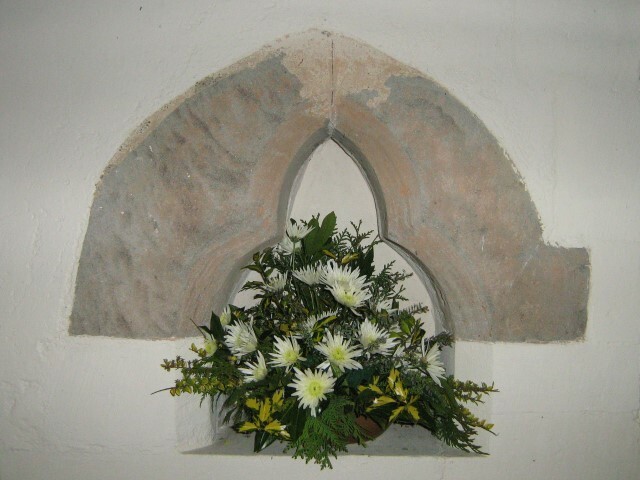 The tracery at the top of each bay is well preserved. 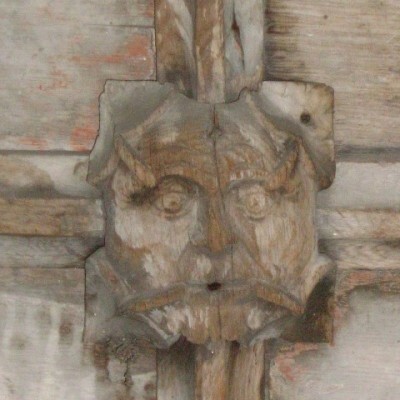 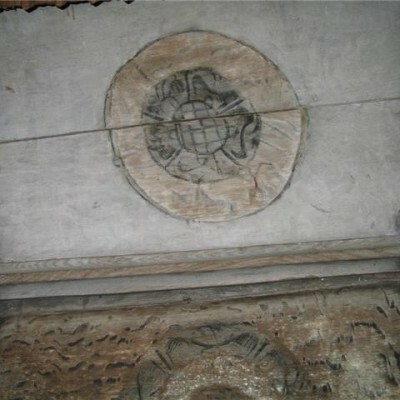 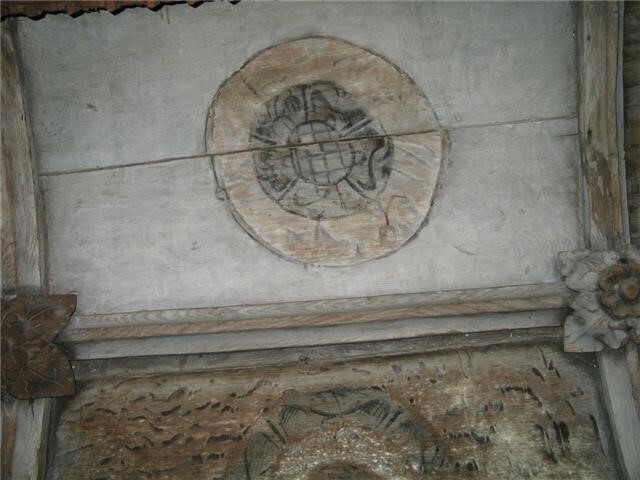 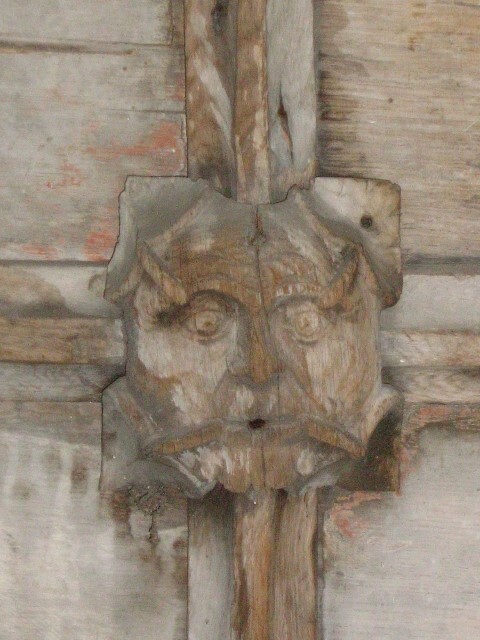 The ribbed and panelled coving, on the chancel side of the loft retains its original medieval motifs, including a Green Man and a Tudor rose. 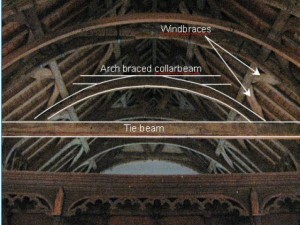 The arch braced collar beams, tie beams and quatrefoil windbraces, though much restored, are a fine example of 15th century carpentry. 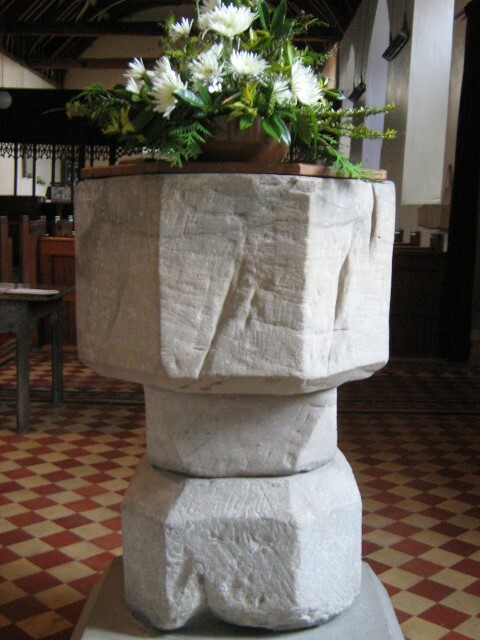 The octagonal font probably dates from the 14th century. 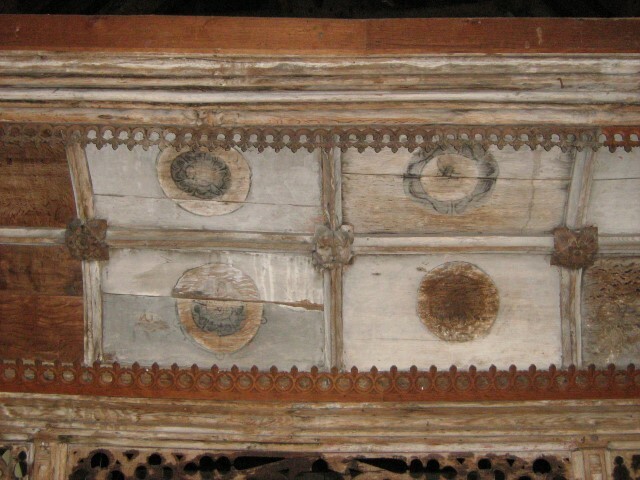 The deep grooves may have been man-made by tools and possibly weapons. It is often reputed that Civil War soldiers sharpened their swords on the font. 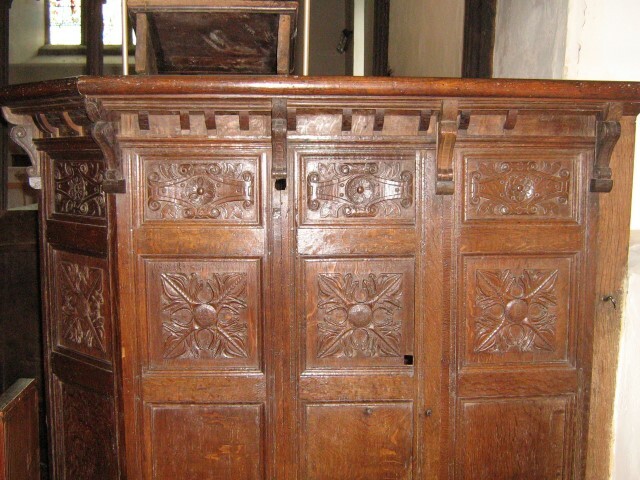 The 19th century pulpit has incorporated some of its 17th century predecessor’s carved panelling. 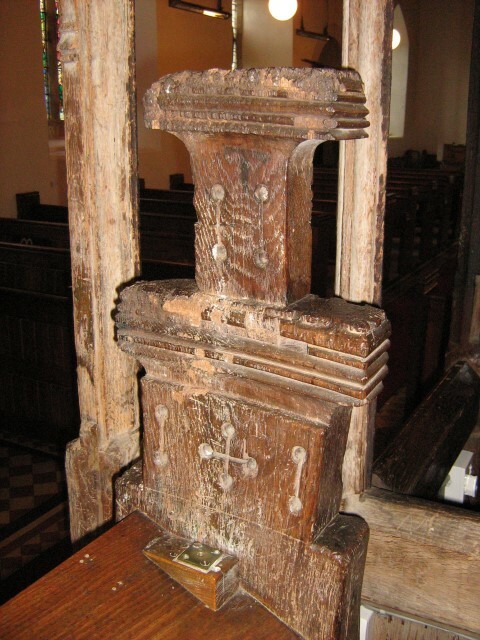 This piece of early rustic carving is part of a former reading desk. 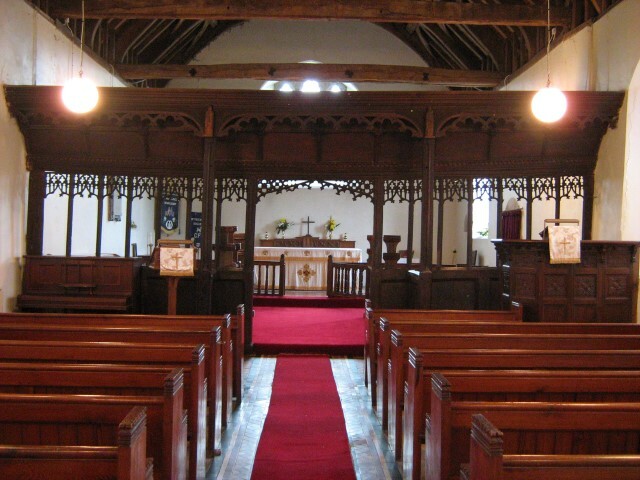 Its style is echoed in the nineteenth century pitch pine stalls and pews. 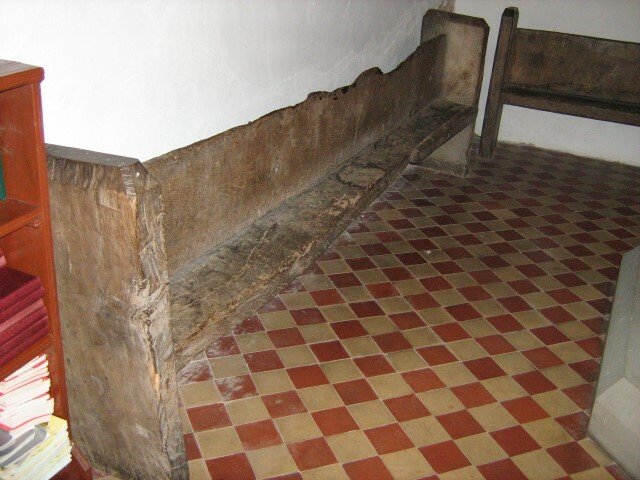 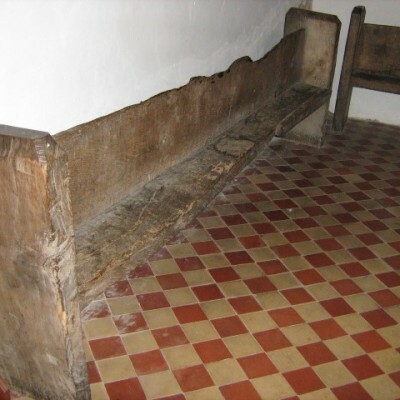 The primitive benches, now in the chancel, were probably used by servants or the poor of the parish. 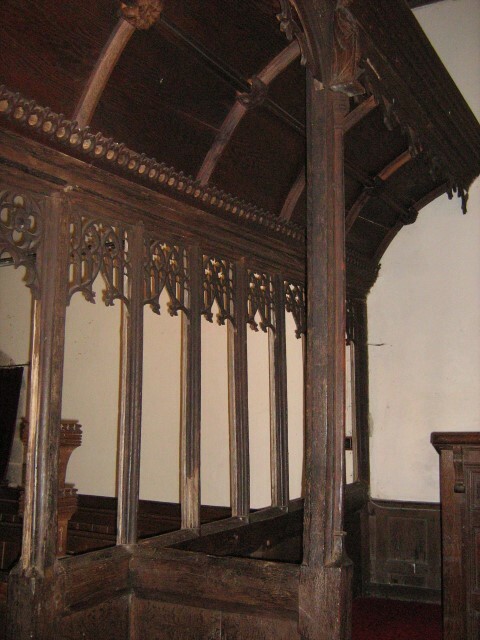 The vestry, where the priest puts on robes for the service, was constructed from panelling and balustrades from former box and canopied pews. 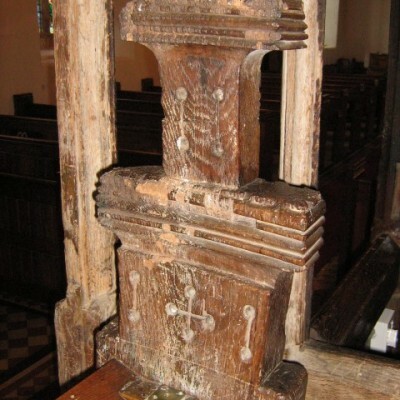 The 18th century altar rail with its turned balusters is probably the work of a local craftsman. 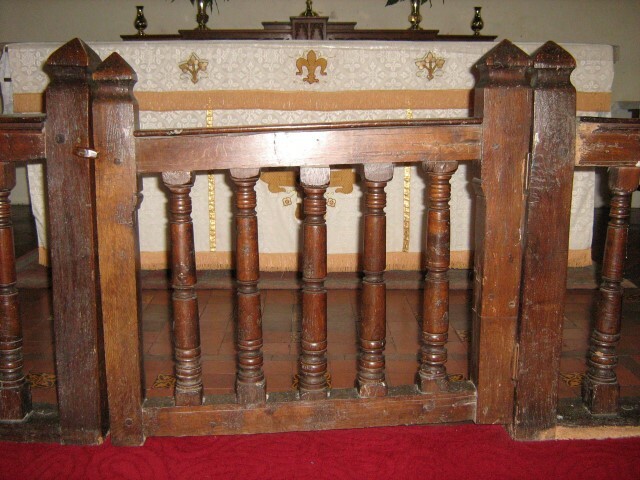 Rails were introduced in the 17th century partly to keep animals away from the altar. 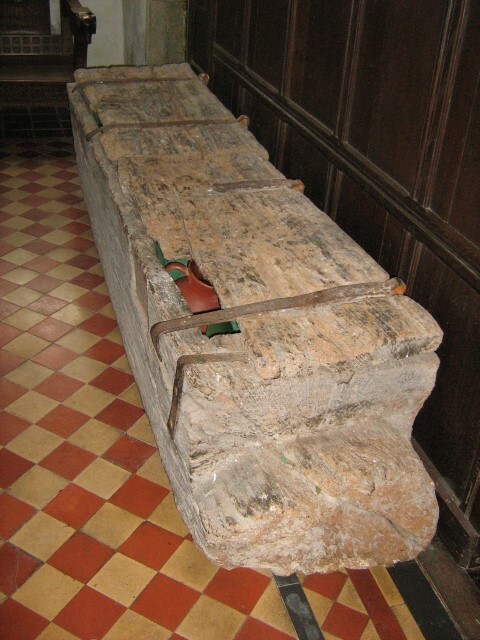 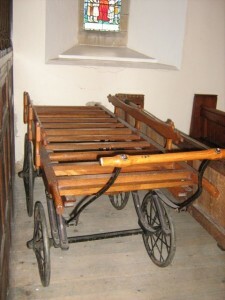 The bier, which retains its old undercarriage, was used at funerals to carry the coffin into the church. 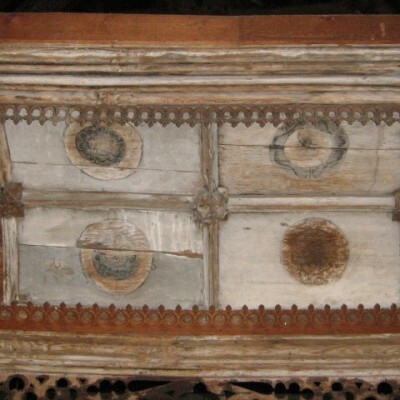 The ancient dugout chest was hewn from a solid block of timber. 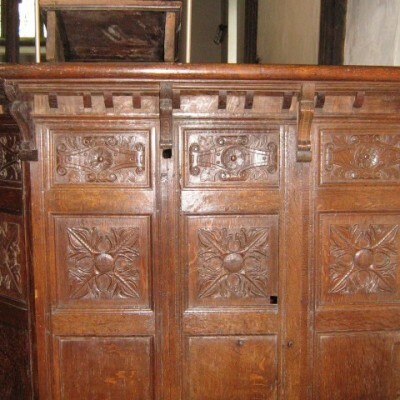 It had two locked compartments for church documents and valuables. 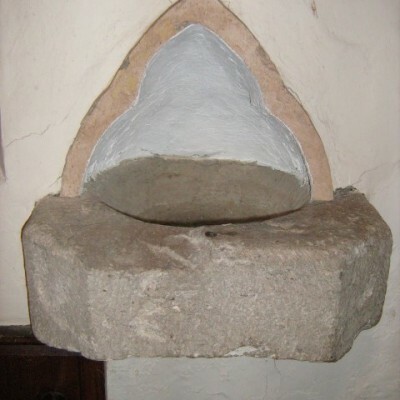 The stoup by the door is unusual because its basin is intact; most were destroyed at the Reformation. 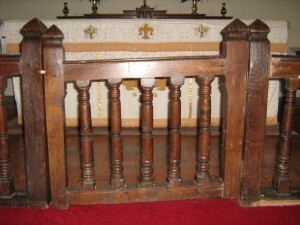 It held holy water for parishioners to bless themselves when entering church. 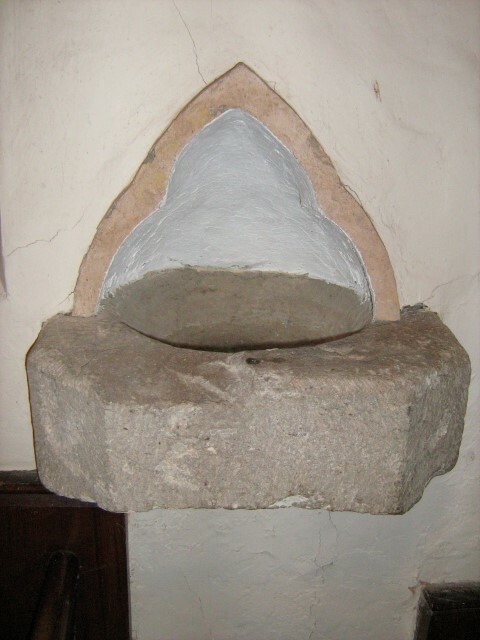 The 14th century piscina with trefoiled arch was used by the priest for washing the church plate after Mass.